Saudi Arabia Monday green-lighted the creation of a joint trade commission with Iraq, heralding thus a new diplomatic era between the two countries, 27 years after closure of land borders. “The Cabinet has decided to approve the establishment of the Saudi-Iraqi Coordinating Commission and to delegate the Saudi minister of trade and investments to sign on behalf of the kingdom,” a statement carried by official news agency SPA said. 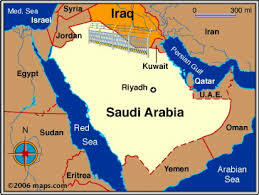 Saudi Arabia and Iraq disrupted their official diplomatic ties in the wake of Kuwait invasion by Saddam Hussein in 1990. But both countries renewed contacts in recent days in a move to boost economic exchange. Iraqi Oil Minister Jabbar al-Luaibi undertook an official visit to Saudi Arabia last week to discuss joint efforts in the fields of energy and future projects between the two countries, Middle East Monitor (MEMO) reports. The two countries are also on the verge of reopening the Al-Jadidah Arar border crossing as part of plans to boost economic ties. The point of crossing has been closed for the entire period of diplomatic brawl but both sides yearly open the border for pilgrims to travel to Saudi Arabia to perform the Hajj. The border is closed after the pilgrims’ return. Written by: KanelkaTagba on August 15, 2017. Posted by KanelkaTagba on Aug 15 2017. Filed under Gulf News, Headlines. You can follow any responses to this entry through the RSS 2.0. Both comments and pings are currently closed.